Today it's overcast here in Ontario so I thought I'd make something warm and comforting. The first thing that popped into my head was rice pudding. Fantastic! Not only is it easy and quick to make, it made me happy just to think that I'd be having some creamy rice goodness in the near future. My method of making rice pudding is stovetop. I know there are numerous recipes for ovenbaked pudding as well and once I get my hands on one that I like I'll give it a try. Finding a recipe was a snap. I have Rose Reisman's Divine Indulgences which contains a lovely stovetop recipe called Rice Pudding with Dates and Apricots. I made a few changes to the actual recipe though. For one, it calls for light soy milk which I substituted with 1%. I have made this recipe previously with vanilla soy milk and it has come out great. There was a little soy aftertaste but it was hardly noticeable. I also left out the dates and apricots because I don't have any in the cupboard right now and I also like my rice pudding without add-ins. Sometimes a small handful of raisins get thrown in but on the whole, I like my rice pudding straight-up plain (with a hint of cinnamon). Today's pudding came out just right. Soft arborio rice with thick sweet milk. Yum. I know many people who don't like rice pudding that much or even at all. I think it is because of the texture. Sometimes 'custardy' desserts don't have a pleasing mouth-feel that turns people off. Perhaps in rice pudding the rice is a detracting factor to some. They want their pudding to be completely smooth and velvety. 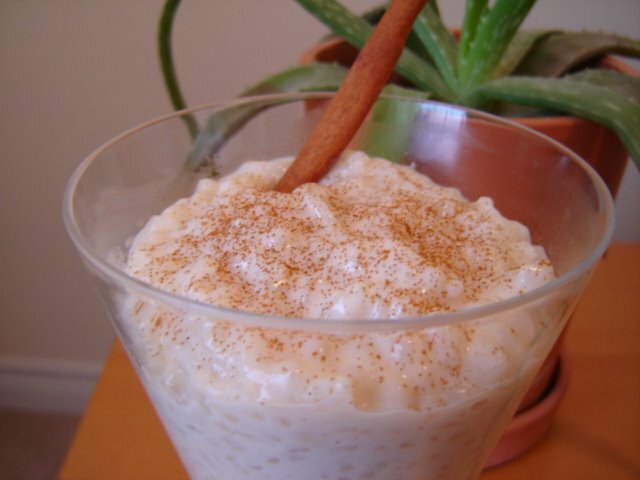 As for those who adore rice pudding, the variations are endless. Some like more rice, some less. Some like it more milky, others like it thick. Rice pudding is the type of dessert that can be tailored to meet almost any need - the type of milk, rice and method of cooking can be mixed-up to get a swoon-worthy pudding. To see other great recipes from Rose Reisman, check out her website. Yesterday Elizabeth hosted a gathering at her home for about 50 people. She asked me to make carrot cake since it can feed a large crowd of people. 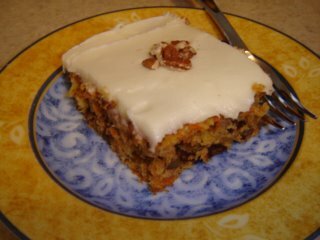 I said no problem and made a the Toll House Carrot Cake from the Treasury of Desserts. The recipe is very easy to prepare and uses all the traditional ingredients including pineapple, nuts and, of course, carrots. There are no raisins in this cake but the recipe did call for chocolate chips which I happily added. From start to finish, the cake took about 1 hour to mix up and bake. It came out very moist and not overly sweet. I did, however, get one request to leave out the chocolate chips next time because it was too sweet. Since I am constantly looking to improve my baking, I asked my sister if she thought this as well and was met with a look of incredulity. The cake was just fine and the cream cheese icing (also from Treasury of Desserts) was complementary. Looking at the 3/4 empty tray I'd say most people agreed with her and thought it was tasty. I will absolutely make this crowd-pleasing cake again and be sure to check out more Toll House recipes at Very Best Baking. Last night my sister had some friends over for a girl party. We had all the requisite 'party food' laid out and I decided to make some squares for the occasion. 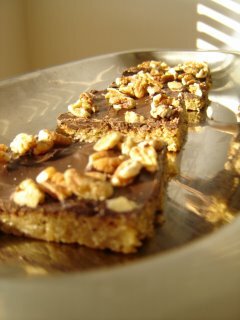 I wanted to make something easy and with chocolate so I consulted my cookbooks and settled on Toffee Bars from Wanda's Pie in the Sky. I bought this book on a whim at a mall booksale a couple years ago. I had vaguely heard of Wanda and after doing the cursory look-through I was sold. (I also really liked the font she used in her book.) Little did I know then that this book would be as useful as it has been. I am now not fazed at making pie crust, although I still do the occasional patch job and her Triple Chunk Cookies are amazing. Back to the toffe bars though, they were simple to make with a wooden spoon - no mixer needed. The crust had the consistency of oatmeal cookie dough and once it was baked all I had to do was melt some semi-sweet chocolate, spread it over the cooled bars and add a sprinkling of pecans and voila, yummy, chewy squares in about an hour. The girls liked them a lot and they tasted even better the next day with some tea for breakfast. If you're interested check out Wanda's website and see what she's got. If I ever get to Yorkville, I would definitely want to check out one of her classes. A fantastic way to spend 3 hours, at least for me! This is my first ever SHF (Sugar High Friday) entry. 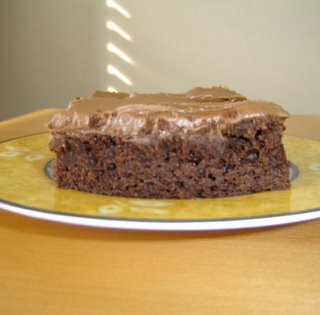 I just started blogging this month and was excited to find a great online community of people who were enthusiastic about all things baked as much as I am. I thought that finding a non-sugar dessert recipe would be an easy task but the more I looked, the harder and more frustrating it got. My cookbooks were not helpful so I turned to the Internet to try and strike gold. My first search of 'sugarless dessert recipes' returned a lot of results but substituted Splenda for sugar. Though I'm not adverse to using Splenda, I don't have any in my cupboard and I really wanted to find something that was naturally sweetened. My next search was simply 'honey' and this is where I found the recipe I'm submitting today. I found a website for the National Honey Board and found that they had a good collection of honey recipes. The one I chose is called Honey Raisin Scones which, not surprisingly, uses honey as a sweetener. The recipe was easy to follow and execute and took less than 30 minutes to have in the oven. It's not glamourous but goes well with a cup of tea or cappuccino. 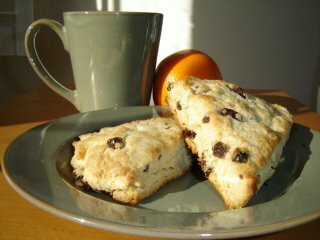 The scones came out light and flaky, not rock hard and dense as some store-bought scones can be. I would definitely make them again - they are just as good as their sugar-scone counterparts. In large bowl, combine flour, baking powder and salt; mix well. Cut in butter until mixture resembles coarse crumbs; mix in raisins and orange peel.In small bowl, whisk together honey, whipping cream and egg. Add to flour mixture; stir until just combined. Turn dough onto lightly floured surface; knead 10 times. Pat dough into 9-inch circle; cut into 8 wedges. Place on lightly greased baking sheet, at least 1 inch apart. Bake at 375°F for 12 to 15 minutes, or until golden. Cool on wire rack. Makes 8 scones. Note: I baked my batch of scones for 12 minutes at 425 F. I usually use a high temperature for scones because the outside becomes crispy and the inside is still soft and fluffy. If baking them at a lower temperature achieves the same result, please let me know. Thanks! Thanks to Jennifer at Domestic Goddess for thinking up this great idea and also thanks to Sam at Becks & Posh for hosting SHF this month. Enjoy! Recently, I've been wondering a lot about sugar. We really don't think about sugar, often just taking it for granted when we whip up a cake or bake a batch of cookies. Although there are many other sweeteners, sugar by far is the most popular. Let's take a closer look at these sugary granules and the many forms they come in. Granulated Sugar - Derived from sugarcane or sugar beets, this is the most common sweetener in baked goods. Brown Sugar - Brown sugar is granulated sugar with molasses added. It comes in two forms - light and dark, the latter containing more molasses than the former. Light brown sugar has a more delicate flavour. Brown sugar should be kept in an airtight container (preferably plastic) so that it will not dry out and become rock-hard. Another type of dark cane sugar is called Muscovado which has a fine moist texture and molasses undertone. Brown sugar is also referred to as yellow or golden sugar. Coarse Sugar - This is mainly a decorating sugar that is sprinkled over cookies before they are baked. The granules are larger than regular white sugar ones. Confectioners' Sugar - This is also known as powdered or icing sugar. It is granulated sugar that has been processed into a powder. Cornstarch is added to prevent caking and it is less sweet than white sugar. The texture is light and cannot be substituted in equal amounts for granulated sugar. It is mainly used for dusting baked goods and preparing icing. Sanding Sugar - This is a granualted sugar that comes in a variety of textures and colours. It is mainly used for decorating cookies and adding sparkle to finished baked goods. Superfine Sugar - This is also known as castor sugar. The grain is fine and dissolves very easily. It can also be substituted in equal amounts for granulated sugar. Turbinado Sugar - It is sold under the name "sugar in the raw" and has a coarse texture and molasses flavour. Turbinado is pale brown and is a great sugar to sprinkle on cookies before they are baked. Vanilla Sugar - This is granulated sugar flavoured with vanilla. As I looked around for information about sugar I came across The Sugar Association where I found some interesting facts. Did you know that sugar helps to reduce the acidity in foods? Fascinating. I also came across the Canadian Sugar Institute where you can read about the history of sugar, sugar production and nutritional facts. So as we can see, sugar is more than something to stir into tea and coffee. I couldn't have done this post without the great book The Good Cookie by Tish Boyle, an indispensible source of information and super recipes. Playing a supporting role for this post was The Fannie Farmer Baking Book by Marion Cunningham. I know that I've mentioned these cookies in another post but I think they warrant further comment. I had some small visitors over today so, in their honour, I decided to make cookies for their visit. They were not so enthused when I mentioned them but when the cookies came out of the oven they enjoyed them. These cookies came from the back of a Chipits milk chocolate chips package. 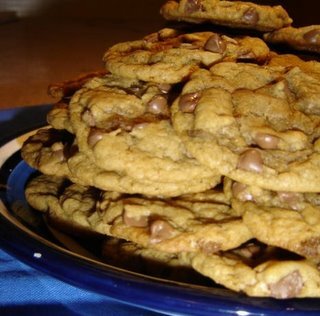 It can also be found on their website under the name Chipits Chewy Milk Chocolate Cookies. One major methodical difference between these cookies and the traditional creaming of butter and sugar is that the butter is melted. This results in the cookies tasting like smooth buttery caramel. My friend Elizabeth said that she could really taste the cookie dough...it was flavourful and rich. They did not turn out too flat, nor were they too rounded. I baked them for 9 minutes and they came out crispy on the edges and chewy on the inside. The recipe was easy to make, kid friendly and fabulously tasty. A definite keeper. Yesterday, some friends and I met for breakfast/brunch at a fantastic restaurant specializing in Middle Eastern food called Paramount. It's located in Mississauga and serves everything from shawarma to baklava. From the outside you might miss it and drive by but, once you enter you're surrounded by a dazzling display of fruit drinks, baked savories and mouthwatering pastries. The entire two hours we were there, not a table was vacant with families coming in for a meal as well as a steady stream of people doing take-out. I ordered tea and a cheese mana'ish - a Lebanese flat bread topped with cheese that came piping hot out of the oven. There are many varieties of this popular menu item including zaatar (a thyme, sumac, sesame seed and olive oil mixture), spinach, sausage, tomato and egg. My friends tried a wide sampling of pastries including maamoul (date-filled cookies), nammoura (a semolina and coconut sweet) and baklava filled with cheese. 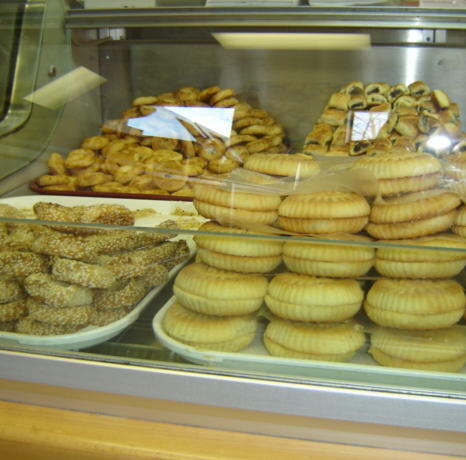 The ingredients used in Middle Eastern baking are not expansive but come in an astounding array of variations. For example, baklava comes as bourma, balouria and kol wa shukr to name a few. 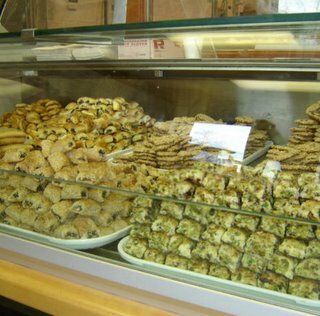 There is a wide use of nuts, phyllo, honey, semolina and dates as well as knafi (Lebanese pastry), cream and cheese. 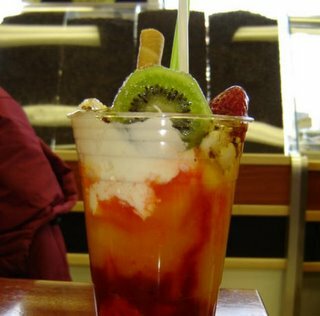 In addition to the amazing pastries, Paramount also serves fresh fruit drinks, kabobs, shawarma, hummus, baba ghanoush, Middle Eastern ice cream, nuts, dried fruit, coffee and pita bread. It is definitely a place to visit especially if you want authentic Lebanese cuisine in a comfortable, friendly setting. Making the perfect brownie is a tricky thing. Most of the people I know do not like 'cakey' brownies. They prefer the more dense and velvety type - the kind that is so chewy that there is little crumb. I have to admit that I fall into this same category and have been trying to make great brownies for years. I've had many disasters but have learned that brownies do not benefit from overcooking and sometimes taking them out of the oven 5 minutes early is a good thing. The brownies I made today are from Robin Hood Home Baking called Chewy Chocolate Brownies. The method was straightforward and they baked for 20 minutes. Once cut, they were not dry nor underdone. They are dense but not so fudgy that they will stick to the top of your mouth. Overall, I'm pleased with the result and will be taking them over to Elizabeth's tonight for tea. The icing is from the Treasury of Desserts which I received as a gift from a university roommate. It's a great book that has come in handy over and over again. The 'Simple Brownie Icing' was indeed easy and simple yet added pizzazz to the humble brownie. I didn't make up the name of this cookie honestly. It's from Better Homes and Gardens 100 Best Cookies 2005. The cookie is chocolate with a peanut butter centre. They were easy to make and took a little longer to make than a regular drop cookies due to the shaping and rolling process. They are soft, brownie-like and rich so one cookie really is satisfying. The only thing that I was not happy with was that I used natural peanut butter (no Skippy in the house) so the peanut putter centre did not entirely flatten and ended up looking more rounded. 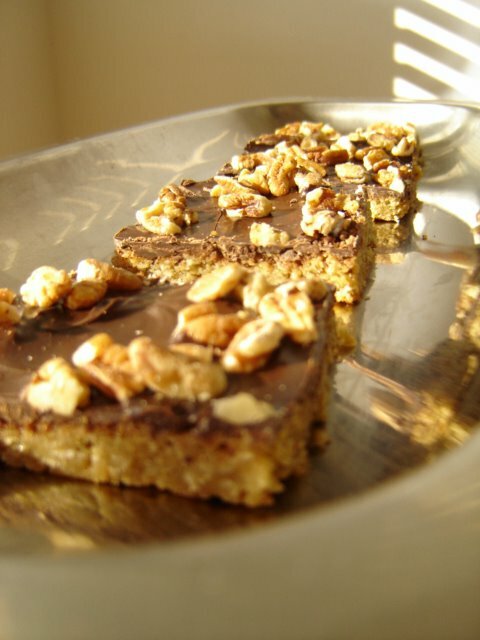 No matter, the recipe is great and I would definitely make these again. The picture shown is exactly the same one that is in the magazine. Napoleon Dynamite: Who are you gonna ask? Napoleon Dynamite: Summer Wheatly? How the heck are you gonna do that? butter adds flavour and influences the texture and moistness of baked goods-the "mouth feel"
sugar crystals have sharp edges that cut into the solid fat and create air cells. If the butter is too soft, these pockets of air will have nothing to hang on to. That's just a small synopsis of our friend Fat. I'm sure I could have added lots more information but I think you get the picture. If you're interested in reading more about butter (and who wouldn't be), I've listed the books I used for this post. I've got another great cookie book called The Good Cookie by Tish Boyle. These cookies are not your standard fare...they're grand. I made the lemon cornmeal cookies because I had all the ingredients in my cupboard. Boyle writes "Known as crumiri in Italy, these are a traditional cookie from the Piedmont region, where cornmeal is extremely popular, although it is used most often in polenta. The cornmeal creates a pleasingly coarse texture and offers a subtle flavor that is the perfect platform for the lemony endnote." (162) Well, she's right. I really enjoy cornmeal cookies - these ones came out crunchy, but not hard. My kids really enjoyed them too which is saying a lot. Perfect with tea, as most cookies are. Next Boyle purchase - Diner Desserts. Two nights ago I hepled a friend make butter tart squares for a brunch the next day. I've make them before successfully and we had decided to use an easy recipe from Clueless Baker. There is no corn syrup in this recipe but do turn out nicely. Anyways, I made the shortbread crust and she prepared the filling including walnuts and chocolate chips. Separately, both parts were good, but when we baked them, the filling bubbled up a lot around the edges. I thought that was strange since they usually don't and the top is a thinly set crust with the gooey centre underneath. No matter, I thought, it was 12:30am and I was tired. They next day I cut them into squares and cut off the edges where the filling had gotten hard. They cut great but the crust tasted like crunchy sugar, not shortbread. So when you took a bite, it was overwhelmingly sweet and granular - not pleasant. I think some squares turned out fine but mine was not good at all. My husband thought he bit into a chunk of brown sugar (which I told him was impossible). I'm just too picky...everyone else who tried one liked them. (I think) Of course, the store bought marble coffee cake was popular (yuck) and the baklava from Paramount was fantastic. The lemon bars were a hit at the lunch. Yeah! This weekend I made oatmeal flaxseed cookies. Everyone loves these since they're so simple and are a bit crunchy from the flax. My sister made super milk chocolate chip cookies as well. They're from the back of the Chipits milk chocolate chips package. These cookies don't get flat like frisbees like other recipes I've tried. I think its because you have to melt the butter - I don't know but I do know they come out fabulous every time. I made a batch of lemon squares last night for my sister. Her workplace is having a post-Christmas potluck and her department had to bring desserts. We made the recipe from Clueless Baker which is easy and straightforward. It was only after I was done that I realized I forgot to add sugar to the base. You couldn't tell because the topping was sweet but I knew. Sheesh. Lemon bars are tricky becasue you can't overbake them nor do you want them runny. Achieving the perfect creamy lemon filling is really satisfying. The bars were very nice but I think the pan may have tilted or something because one side had a thicker filling than the other. Oh well, my sister and husband tested them last night and they got a thumbs up and with a sprinkling of powdered sugar, they were the perfect teatime treat. Here are some of my favourite recipe books. I 've been all the Internet and tried lots of different recipes. AllRecipes is too random - people may rate a recipe high but then make all kinds of substitutions that you really wonder if the original recipe was any good. Also, I'm not a big fan of packaged goods so a lot of their recipes don't appeal to me. Canadian sources for baking are amazing...even Rose Reisman's Divine Indulgences is fantastic and it is all low-fat baking. I don't usually bake low-fat but her recipes are sweet. One book I would like to buy is In the Sweet Kitchen by Regan Daly. I know it is reference book but I could read it like a novel. I love baking. The thought of creating something yummy out of a bunch of random ingredients just plain makes me happy. I love measuring, cracking, melting, mixing, rolling and chopping. Even the thought of trying a new recipe can destress me as I imagine how it will turn out. Will it be a keeper? Baking takes me to a peaceful place full of sugary goodness. The point of this blog is to share successes and failures with all things chocolately (or not) and a few other things thrown in for fun.